Gerald McCra Jr was age 15 when he shot and killed both his parents and younger sister. There had been violent incidents before but on Oct 9th 1993 whilst he was having an argument with his mother, something in Gerald snapped and he shot her and then the whole family one at a time. Gerald Jr’s chart is a very difficult one. Sun Taurus, Moon Scorpio, Leo with Mars rising gives tremendous intensity and physical strength, but any potential problems in the chart are severely increased by the exactness of many of the aspects. The Sun is 1 degree from an exact square to Mars, which could certainly account for an aggressive nature. Mercury is exactly opposite Pluto to within 4 minutes and this opposition is within 20 minutes of the 4th – 10th house cusps showing considerable verbal explosiveness and the strong likelihood that this would be expressed within the family. An extremely difficult Moon in Scorpio in the 5th is opposite Venus and T-Squared to Saturn – both Moon and Saturn are at 23 deg 39 min. So we have extreme difficulties in relationships with women in the family and the mother in particular. The intensity of this aspect is quite enough to make him attack his mother. Merle McCra, his mother also has a very difficult chart. 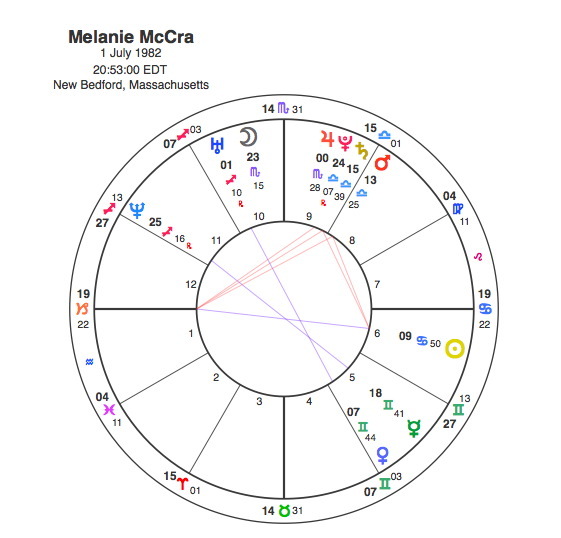 Her Moon is in Scorpio at 22 deg 46 within a degree of her son’s Moon, but it is also exactly conjunct the 8th house cusp of death by 12 minutes. The Moon is part of a very difficult T- Square opposite Mercury and square Pluto. This T Square is the clearest astrological example of a murder victim imaginable. The 8th house and particularly its cusp is traditionally linked with death and the fifth rules children so this combination points to Merle being killed her son. 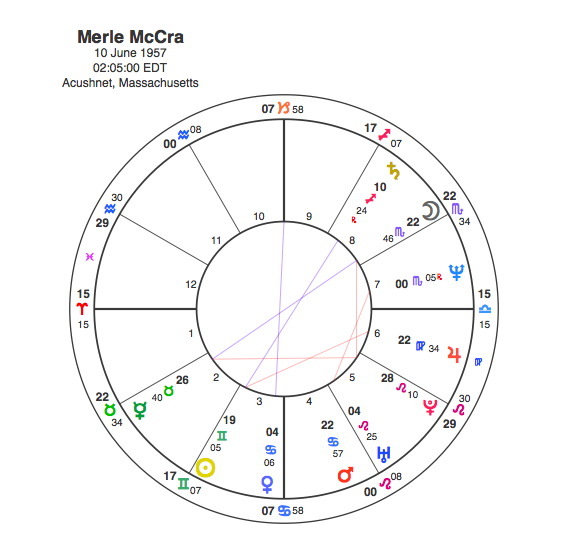 The sister, Melanie McCra has a difficult Sun in Cancer square to a Mars / Saturn conjunction which would indicate troubles within the family but staggeringly her Moon is also in Scorpio at 23 deg 15. So all 3 of them have the Moon within a degree of each other. 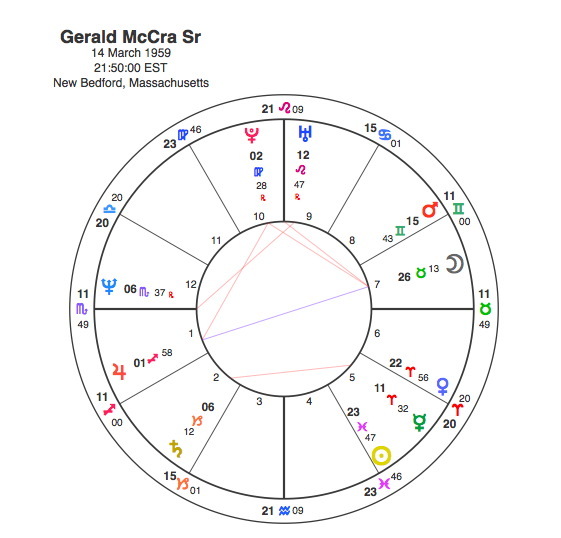 The father Gerald McCra Sr has his Moon at 26 deg 13 Taurus in direct opposition to the Scorpio Moons of the rest of the family. Like his wife, he also has a Tsquare that focuses on Pluto. Gerald senior’s Sun is bang on the cusp of the 5th house in square to Mars close to the cusp of the 8th house again suggesting violence at the hands of his son. 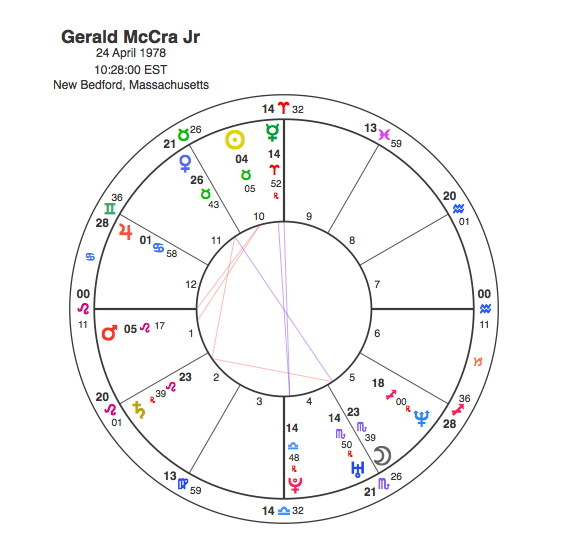 Gerald Jr’s chart suggests a strong likelihood of violence against other women in the family, particularly the mother and he shares exact Moon positions with Melanie and Merle . Extreme violence, even murder is clearly on the cards with this combination. It is quite common for family members to have important planets in their charts linked by aspect, but the chances of having 3 people in one family sharing the same Moon degree are thousands to one against. Of course the problem with having all these Moons so close together would be that any passing transits would trigger them all at the same time and since the charts are very difficult anyway, the results would be horrendous. The one that would cause by far the most havoc would be Pluto to conjunct these Moons as Pluto is the ruler of Scorpio and is the focal T Square point for both parents and bang on the 4th house cusp for Gerald Jr. Pluto would only make one such contact in their lifetimes, unfortunately it would only need one. On 9th Oct 1993 Pluto was at 23 deg 57 Scorpio, exactly conjunct the Moons of Gerald Jr, Merle and Melanie, it was also opposed Gerald Sr’s Moon. The tension in all four charts was unleashed to catastrophic and tragic effect. This terrible tale is the result of the coming together of some of the most difficult charts that Capricorn Research has ever seen. The tragic results of Pluto’s transit were sadly predictable. Very interesting case study.Pluto transits always seem to have more of a ‘fated’ quality to them in my experience. Reading this reminded me of a similar tragedy in Oxford years ago, no birth data but will have a look at the ‘event’ chart and do a bit more digging. Thanks for another thought-provoking read.